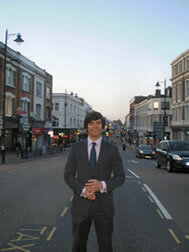 Christian Klapp called for new powers to control “chuggers” – so-called Charity Muggers - in Putney High Street. Christian Klapp, Labour candidate in the Putney by-election on Thursday 30th June, has called for new powers to control “chuggers” – so-called Charity Muggers - in Putney High Street. Most days of the week there are up to six chuggers in Putney High Street, harrassing High Street users and making an already inhospitable town centre more unpleasant. In the Republic of Ireland, for example, all chuggers have to acquire a permit from the Police before they can fundraise. Christian wants it to be a council responsibility here so that the decisions can be made in public, accountably, residents and shoppers can have their say, and because councils already regulate other aspects of town centre activity like entertainment and alcohol licensing. “At the best of times Putney High Street is a grim place to be with illegal levels of pollution, congestion, grubby, uneven pavements, clutter, rubbish and not enough space for pedestrians. Chuggers just make our gruelling daily encounter with Putney High Street that bit more stressful and unpleasant. At best they’re annoying – but at their worst they’re aggressive and prey on those who can’t afford to say yes but are just too nice to say no.